Bald eagles are nest at the Magee Marsh Wildlife Area near Toledo. COLUMBUS – Ohio’s resident adult bald eagles are already busy preparing for the next generation of eaglets, according to the Ohio Department of Natural Resources. Female bald eagles in Ohio typically lay one to three eggs sometime in mid-February or late March. Eggs are incubated by both parents for about 35 days, and the young eagles leave the nest about three months later, usually before the Fourth of July. March is a fantastic time to get outdoors and view eagle nests, as the trees have yet to leaf out, providing the public great views of active eagle pairs. Bald eagles typically nest in large trees such as sycamores, oaks and cottonwoods near large bodies of water with an ample supply of fish, their preferred food. In Ohio, the western Lake Erie marsh region (Ottawa, Lucas, Erie and Sandusky counties) is home to a sizable population of bald eagles. Excellent viewing opportunities can be found at Magee Marsh Wildlife Area, Pickerel Creek Wildlife Area, Ottawa National Wildlife Refuge, Mosquito Creek Wildlife Area and Killdeer Plains Wildlife Area. In the southern part of the state, eagles usually nest near major rivers such as the Muskingum, Hocking, Scioto and Great Miami. However, bald eagles can be found in nearly every county throughout the state, including urban settings. One famous pair resides just over 2 miles west of downtown Columbus along the Scioto River. Although bald eagles are no longer endangered, they are still protected under the federal Bald and Golden Eagle Protection Act. It is illegal to disturb bald eagles. When viewing these majestic birds, remember to respect the animal’s space and stay at least 100 yards away from the animal or nest. 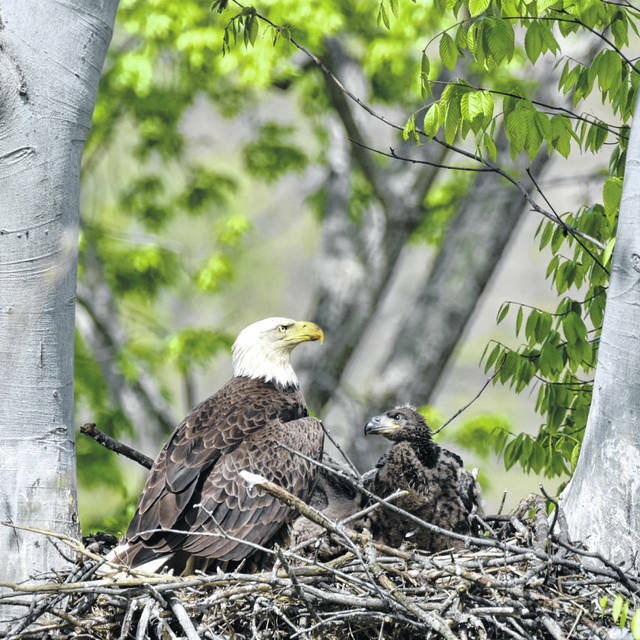 Disturbing bald eagles at the nest site could lead the pair to abandon the eggs.